Whilst running is a cardio sport, it still requires a great deal of muscle strength. 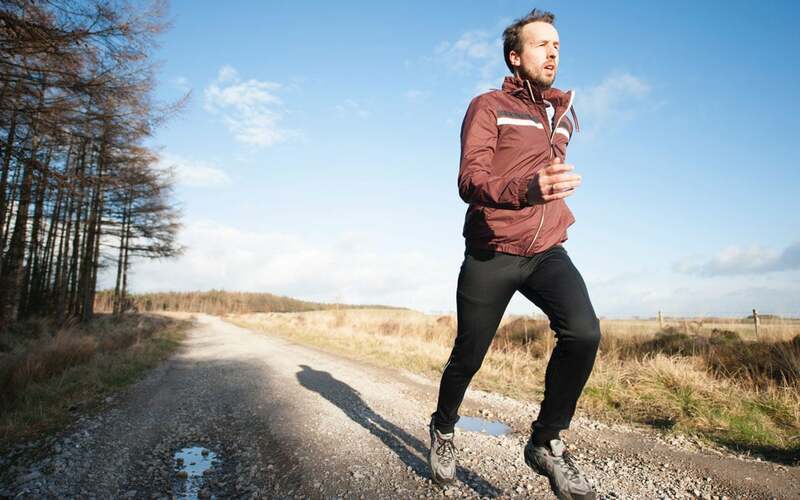 Strengthening key areas will improve your running pace and reduce the risk of injury. Good running form requires stability at the pelvis, freedom at the trunk to rotate, and balanced flexibility with strength of the hip muscles. Towards achieving this, the following routine can be effective (the following exercises could be done for a minute each for x3-5 sets). Action: Feet hip distance apart raise up onto your toes keeping your ankles over your big and 2nd toe. Keep your heels off the floor as you fold at the hips and knees into a hover squat. Pause before lowering your heels. Return to standing and repeat. Benefit: Builds endurance and stability control at the hip; improves balance; trains hip control. Action: In standing, bend your knees into a small squat, then shift your weight onto one leg. Engage your core to support your balance. Keeping your body still, extend your other leg behind without arching your back. Don’t worry about lifting your leg high behind you but instead focus on elongating your leg. Repeat this action for a full minute on one side. 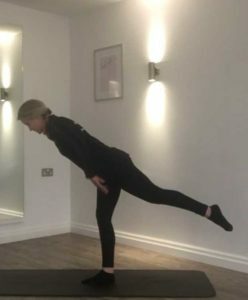 Benefits: A great core and balance exercise; lengthens the hamstring whilst control the hip. Action: In standing, shift your weight onto one leg and extend your other leg behind you. Keeping your leg in line with your spine, fold forwards over your supporting hip. Pause in this position before lowering your leg whilst maintaining your spine in a long position, not slumping at the chest. Benefits: Strengthens core, upper body and legs; builds endurance and trains breathing control. Action: Line your hands and knees under the shoulders and hips respectively. Ensure your spine is in a long position, not slumping or arching. Exhale as you engage your pelvic floor whilst pushing through tucked under toes. Lift your knees 2 inches off the floor and hold for your inhale. Lower, reset your posture and repeat. Progress this by holding for repeated in/exhales. Benefits: Strengthens gluteal muscles; challenges pelvic stability at supporting hip. Action: With a theraband wrapped around the back of your legs, enagae your core to prevent your spine arching. Whilst keeping the knee flexed, press the leg directly back. 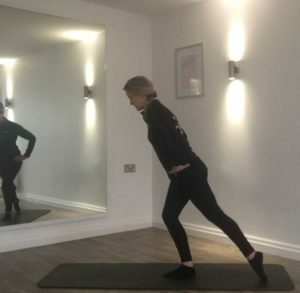 You’ll feel the back of the thigh and gluteals working. Repeat for a minute on each side. 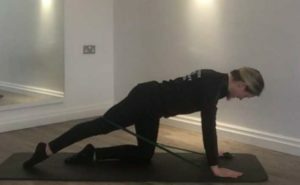 This can be done without the band if you are unable to maintain good alignment or alternate legs allowing time to correct your posture before each rep. Benefit: Gluteal endurance with hamstring strengthening. Action: Like the Donkey kick lift your leg behind whilst maintaining your back and pelvis alignment. Keeping your core on straighten and bend the knee. Repeat for one min on each side. Benefits: Quads and gluteal strengthening; aids correction of tight hip flexors. 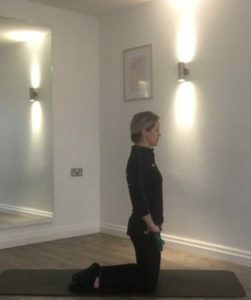 Action: In kneeling, lift the hips forwards by gently tucking the tailbone under and squeezing your gluteals. 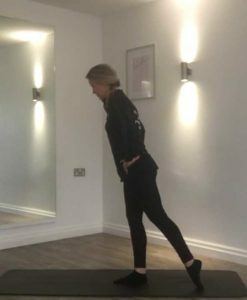 Ensure you keep your lower back long by leading the movement from the tailbone. Progress this exercise by using a theraband between your hands. As you come up into kneeling pull back like a bow and arrow allowing your body to twist. In order to reach peak performance, make sure to include stretch and release exercises alongside a consistent routine of strength and conditioning. Towards this, please check out our article on the best stretch and release exercises designed specifically for runners. For further assistance in taking your running to the next level, get in touch today to book a physiotherapy or sports massage appointment.